It’s happening all too quick this year for me, the supermarkets are gearing up for it, the people are saving up and wrapping themselves up for the cold weather and the banks are awaiting the massive emptying of accounts, that’s right, its Christmas time once again. I do love this time of year, the atmosphere, the months leading up to the big day which are filled with cosy nights in, good films on the television and of course, wintery nights out celebrating the best of the winter and what better way to bring this cold season in than a good old fashioned hog roast Basildon and a mug of mulled wine! I live in Basildon, Essex and have done for many years, do love the Basildonians (a term we use for the locals) I have been a hog roast Basildon caterer for the best part of 6 years having worked in a local carvery since leading school and gaining experience in roasts and my favourite types of meat. 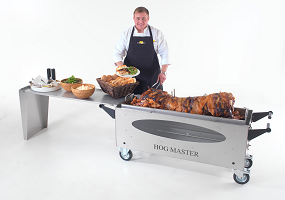 I decided to become a hog roast Basildon chef ever since I attended a family gathering back in 2004 and my uncle had bought in outside catering which happened to be a hog roast chef from London. I took my first bite and never looked back, the taste, texture and above all else the aroma that filled everyone’s nostrils and hearts that day! The chef informed me of his own marinades and techniques that he used when it came to preparing the hog before roasting and I was sold on a career in hog roasting. I have catered to many events and parties throughout the year but my favourite has to be my winter roasts, I like to get a real festive feel to my roasts by adding cloves and honey glazes to the hog itself. Here in Basildon we have a great complex which was purpose built for wakeboarding, for those of you who don’t know about wakeboarding, it is like water skiing with one singular board on which riders perform stunts and tricks, this type of activity isn’t as popular in winter months but the clubs and riders all like to meet up and have a good old fashioned knees up. This is the most recent of my hog roast Basildon events I had the pleasure of roasting three hogs for a large party of wakeboarders. I did three different hogs, one honey and clove hog which was stuffed with sage and onion stuffing that I made the day before. Another hog was cider injected which gives the meat a serious flavour and succulence. The last hog I roasted was just rubbed with herbs and paprika this gave the pig a great colour and appearance. My hog roast hire Basildon turned out to be a great success, in the winter months I like to compliment my hog roasts with separately roasted vegetables and warmed baps. This is one step closer to my ideal winter feast of a roast dinner on the go! It was an idea of mine a few years back and my guests certainly seem to enjoy it! Succulence from my hog roast hire Basildon has always been an essential part of my work I have strived for a long time and had many failures in getting the correct balance of tenderness and taste. This hard work has paid off for me as I won an award for best outside catering in our local newspaper last year and one of the judges said the he had never had such a tasty piece of meat. My hogs are roasted for a minimum of 14 hours; this is slow-cooking at its finest. We all know the benefits of slow cooking from stews that melt in the mouth to chilli that has so much flavour that you can’t eat enough of. The same principal applies to one of my roasts, succulence, flavour and variety. These are all the angles I like to work from with my hog roasts as well as incorporating great tasting beers and wines. I love my work and I like to think that all of my clients do as well. I guess my numerous repeat bookings back that up. Having worked in many different areas around the southern regions of the UK, I can safely say that my hog roast Basildon are my favourite after all; it is my home town and my favourite place to be.